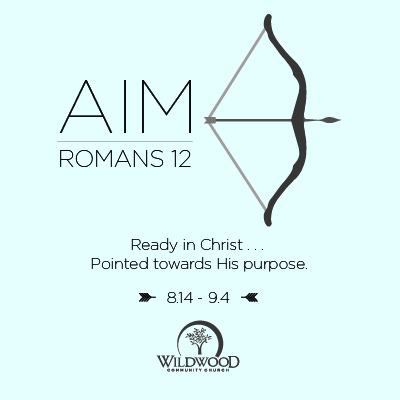 On Sunday, August 14, 2016 I preached a sermon at Wildwood Community Church based on Romans 12:1-2. This message was part 1 in the “Aim” sermon series. Below you will find a set of questions for personal reflection or group discussion based on this message. What are you “aiming at” this year? What are some big goals you have for the next 9 months? What are some of the ways that you have been made ready in Christ (based on what you know from Scripture, especially as detailed in Romans 1-11)? What are some specific areas of your life where it is difficult for you to “lay down your life as a living sacrifice” before God? What would it look like for to live this year as a living sacrifice before God? What are some of the ways in which you feel your mind is being conformed by the world around you? What are some ways in which you have seen your thinking transformed by God? What applications did you take from this Sunday’s sermon?